Published December 30, 2011 at 1259 × 976 in Art. This is the last painting that I created in 2011. It is an acrylic painting showing how we can weather a storm in our lives, with the Lord’s protection. 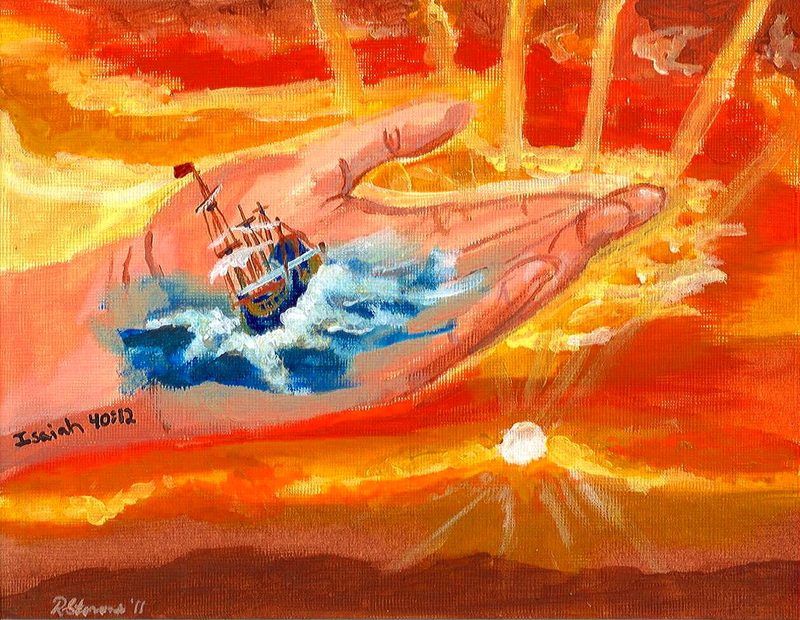 This came about after listening to a teaching by Beth Moore called, “Wrecked But Not Ruined” based on Acts 27-28:1-6, which talks about the Apostle Paul’s shipwreck experience and how the Lord used Paul to direct all aboard the ship to safety. Although the ship crashed, all the lives were spared. Also in Isaiah 40:12 it says ” Who hath measured the waters in the hollow of his hand, …”. It is encouraging to think how the Lord holds onto us in the midst of any storm, if our lives belong to Him. When we know that He is in control we can trust Him to bring us to safety and place us where we need to be. I pray that you are encouraged by this. God Bless you.